AAA Carolinas! Get $20 off new membership for AAA Carolinas only. Get up to $20 off TurboTax products for AAA members. AAA South Jersey only! Get 50% off Basic Primary Membership & 1 free Basic Associate Member. Camden, Gloucester, Cumberland, and Salem Counties only. AAA Carolinas! Get a Free Enrollment, 13 Month Membership & $30 Off Any Membership Level! Get a Free AAA Membership for your household members at AAA Northeast. Save $34 on your primary & associate enroller fees at select Southern New England zip codes (certain cities in CT, MA, NJ, & RI). AAA Ohio – Get 25% off new classic memberships + 2 tickets to the Great Vacations Travel Expo. Get $25 Off 1 New Primary AAA Colorado Gift Membership + $25 eGift Card. Must provide valid email address to receive e-gift card. Valid for new primary gift memberships only. Recipients must be Colorado residents. One e-gift card per new membership account. Save $10 on every AAA gift membership. Save $10 on enrollment fee. AAA Carolinas only. 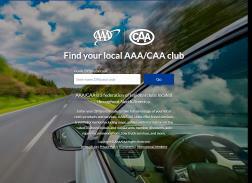 Get AAA Gift Membership 13 months for the price of 12 – AAA Northeast.